I'm making a baby shower centerpiece for a baby shower that is coming up. Angie asked me to post the photo of the centerpiece when I finished it. 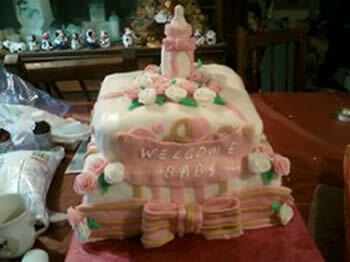 I made this baby shower cake with a molded chocolate candy baby bottle on top. The flowers and bows are made from homemade fondant. 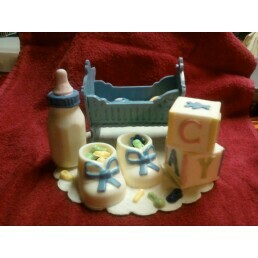 Thanks so much for coming back and showing us the finished centerpiece for the baby shower. The photo of the chocolate baby cradle that you submitted earlier was truly inspiring, so I was very eager to see the finished project. Now that I see the rest of your adorable chocolates, I'm even more impressed. Great job! The detail that you have painted into each of your molded chocolates make them look so real. You've got a great skill at chocolate making. Have you been doing it for quite a while, or are you just venturing into making molded chocolates. I'm sure any tips you've learned along the way would be so helpful to other visitors who come along and ooh and aah over your molded chocolate centerpiece photos. We'd love to have you add your photos too. You can use the form on the bottom of our best desserts page. If it doesn't "fit" there, I'll move it to the most appropriate page. There are usually forms on the bottom of most of the category pages (on the left navbar) for different types of treats, but it's no big deal either way. The main thing I ask is that you give as much information as possible about your photos. For example, tell us how you made it (instructions are fantastic! ), what the occasion was, any problems you ran into, the reaction of the guests, etc. Anything that makes it personal and more interesting is a big help. Google has gotten funny lately about not having enough "content" on a page, so I don't want to have a page with just an image or two and a couple of sentences. The more human interest or helpful tips the better. Can't wait to see what you have to share! Oh, I just remembered I made a baby cake with royal icing candy for bars and "stuffed" animals.I do not know where to upload pictures on this site? I would be happy to do that if you want. You did a really amazing job on the decorating. I'm so impressed by your skills. Keep sending us your creations. You inspire us all! Thank you very much. I have used this to make a baby shower cake. I cant find the picture of it. I did make a baby shower cake with just the bottle on it. Candy is the easiest thing to work with. I use the candy melts. I was so impressed by your work. Until recently my medium of choice for modeling edibles has been fondant, marzipan, royal icing, sugar molding and cake. I never really got into chocolate. I love the look of this medium and am ready to plunge in. I hope to be as good as you. I agree, your centrepiece is fantastic! I imagine the hostess is going to be very impressed. I'm glad you came back to show it completed too - the baby crib part looked so good before it was even finished and you had piqued my curiosity.